Have you ever been to this famous street in Singapore mostly seen on travel blogs named Haji Lane? Since I came here way back in 2011, I have never been to this picturesque tourist spot in Singapore not until last week on a sunny sweaty Sunday when I decided to check out this historical attraction with colleagues for some coffee shop hopping and of course, OOTD for daily dose of IG post! This colorful lane hidden away in the heart of the Muslim quarter, is a fashionasta's paradise. Haji Lane is known for some of the best local fashion boutique and Middle Eastern cafes usually visited by young peole. 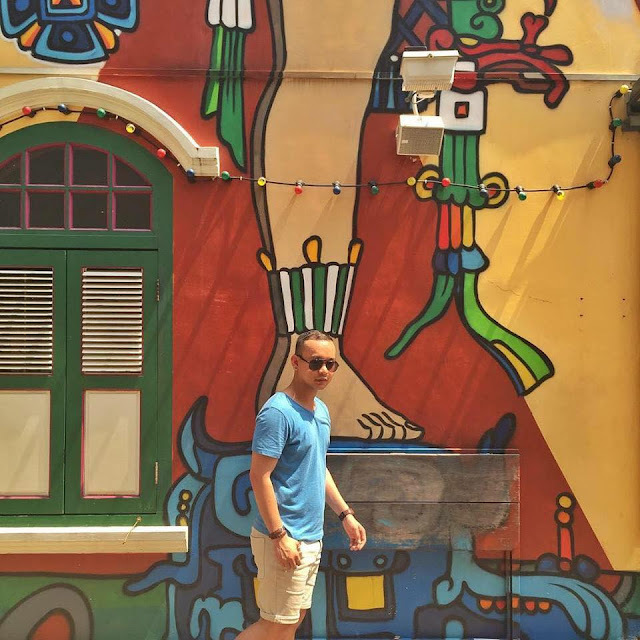 The colorful designed walls and intricate artistic decors of this Kampong glam neighbourhood in Singapore is definitely a tourist desination you don't wanna miss! 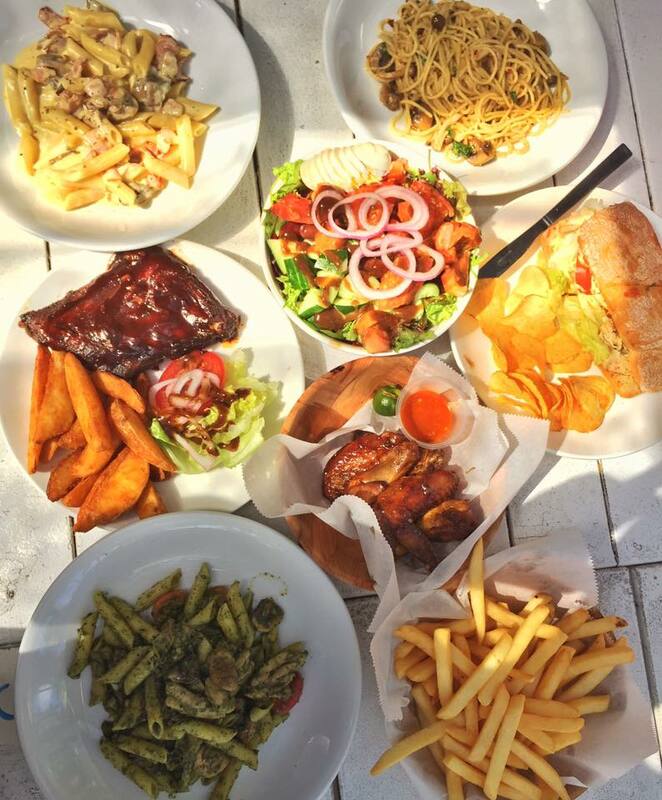 Coastes Singapore is the best beach vibe dining spot whenever you're in Sentosa's Siloso Beach. Imagine yourself basking under the heat of the sun, overlooking the beach, sitting on deck chairs and sun beds while enjoying their palatable menu items perfect for Saturday meet-up with friends or get together family Sunday lunch. Coastes Singapore is located along the golden stretch of Siloso Beach for a casual laid back beach vibe. Wearing it Like a Pro, that's how you strike a look when travelling. This look came up from a random selection of clothing items in my luggage. I fell in love with this statement shirt from H&M but since it's not weather appropriate, I came up with wearing a plaid shirt from Forever 21 and paired it with this cargo shorts from Pull & Bear. I'm wearing Sperry navy blue boat shoes and throw in some oversized sunnies and white Sporty cap to complete my look. What do you think of this look? I'm seriously not a football fan though I know for sure there's one player same as my last name, "Fabregas" and the famous Premiere League season quite popular here in Singapore, and that's all I know! Football Club Barcelona, one of the most commercialized tourist spot in Spain, just signify Spanish true love in sports. For a single adult ticket price of 23 Euros, I was hesitant at first to purchase it, but it was all worth it, seeing for the first time the football stadium was just a surreal experience. 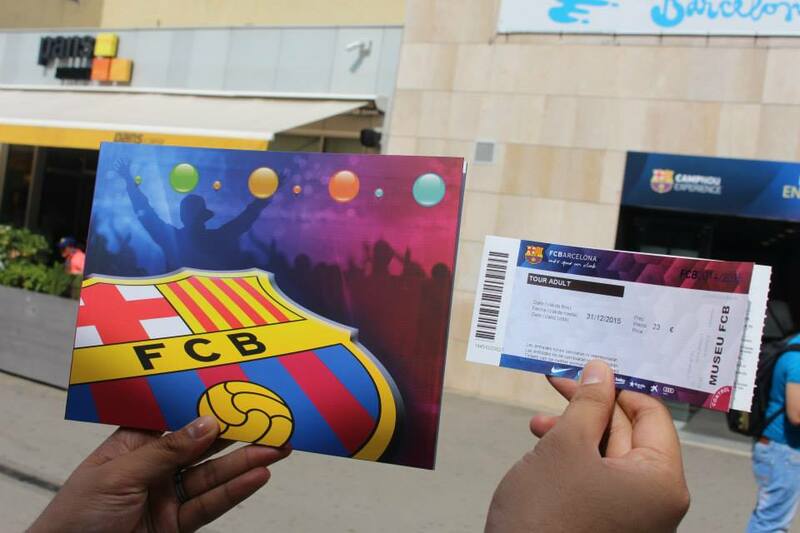 The fee includes an FCB brochure, football fanatic memorabilia and you can access the FCB museum where football history was illustrated in details. It was a big check on my bucket list after I entered the football stadium so big that I just normally see on TV. Inside the FCB Museum, I saw my dream shoes, the Adidas Stan Smith sneakers signed by Stan Smith himself. You will enjoy for sure the FCB Store, where you can buy football team uniform, personalized jersey and souvenirs. FCB Barcelona is located in central area of Barcelona so taking a cab from your hotel is the best way to get there. Futbol Club Barcelona commonly known as Barca. 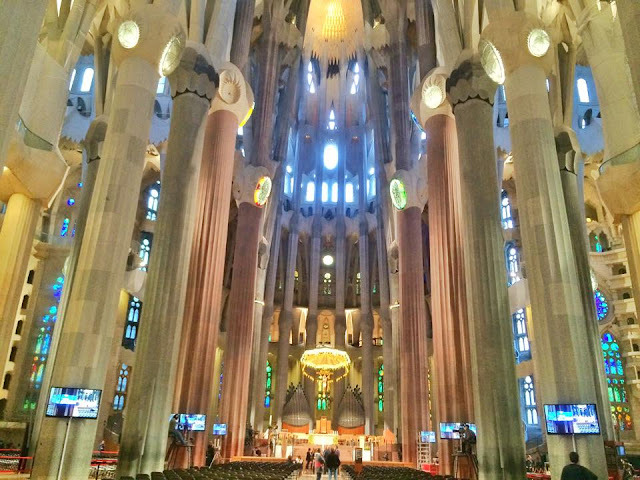 Speaking of the most famous church in Barcelona, Spain the Sagrada Familia is a UNESCO World Heritage Site designed by Catalan architect Antoni Gaudi. This roman catholic church is the most extraordinary personal interpretation of Gothic architecture since the middle Ages. Basilica and Expiatory Church if the Holy Family is a large Roman Catholic church in Catalonia, Spain. It is still incomplete but was already consecrated by Pope Benedict XVI on November 2010. I was really amazed by the its structural wonder, truly one of a kind. I know lot of Catholics would really love to see this church and definitely a must see travel spot when you visit Barcelona. This nautical look inspired by denim on denim trending style was the perfect OOTD on my first day in Barcelona. 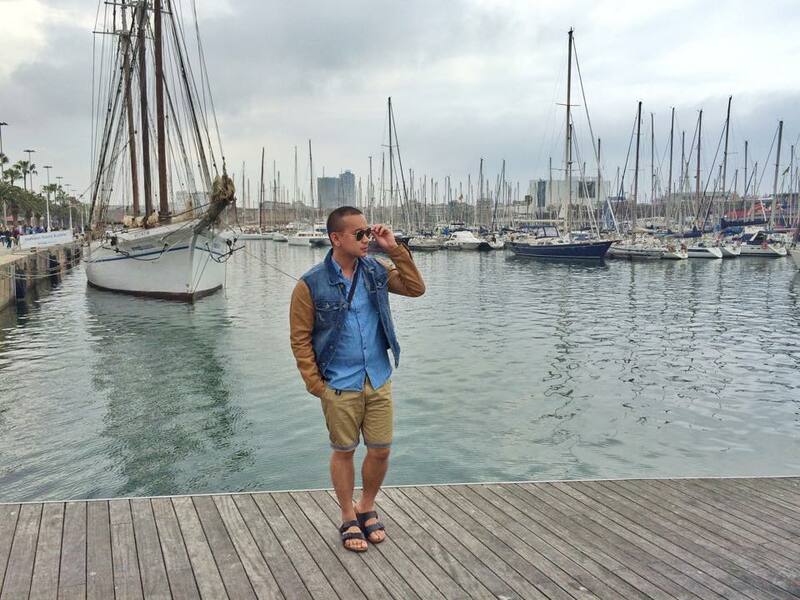 Strolling around La Rambla street and ending up at Port Vell, this was just the perfect spot to take some selfie and fashion blog post. I am wearing leather and denim jacket from Zara Man and Oxygen denim button down that complements well on my jacket color tone. The brown shorts is from Pull & Bear and finish my look with Birckenstock mandals and classic Ray-Ban aviators. 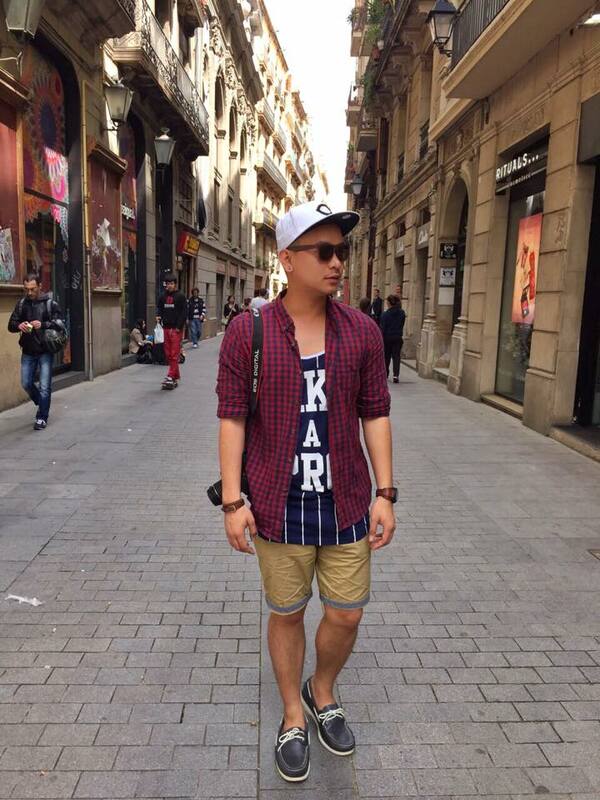 This look will never ran out of style and perfect for a sunny yet cold weather of Spain. Keep on following my blog for more travel, food & fashion post this week. Port Vell which literally means "Old Harbour" located in Catalonia, Barcelona Spain is a waterfront harbor with around 16 million people visiting this tourist spot every year. 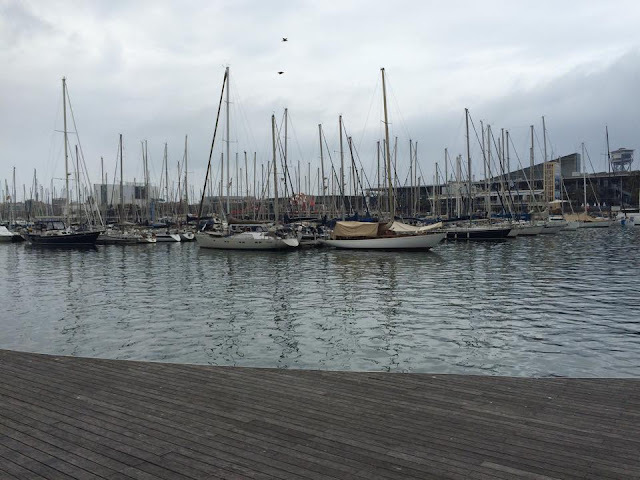 It's just a walking distance from the famous La Rambla that is connected by Rambla del Mar. It is now one of Barcelona's most visited spot in Barcelona, you can also find here Marémagnum and Europe's largest aquarium. Just stroll along the Marina area while digging into a cup of gelato, or visit the old custom building, up til the night view of the Port Vell, you'll have a good time in this side of Barcelona. Eating tapas is one thing you shouldn't miss in Barcelona. Lingering around tapas bars in Barcelona seems to be a lifestyle that I truly enjoyed, and Cerveceria Catalana is the best tapas spot you must try at least once in your life. Ask anyone where the best tapas could be found and they would tell you Cerveceria Catalana. The place is extremely crowded throughout the day and expect long hours on the process of queueing and waiting for a seat. You'll see the crowd mixed of locals and tourists waiting for their favourite tapas and drinks to be served. Get the assorted tapas consisting of prawns, clams, green pepper, fried small fishes and potato croquette- to share. Life is perfect especially when you have a jar of Sangria. 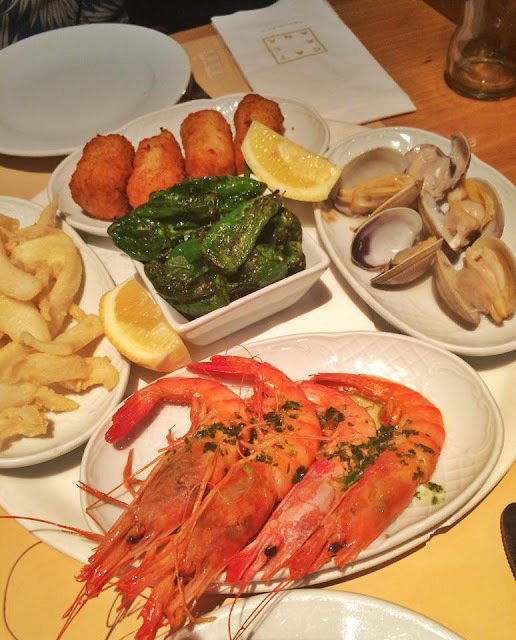 Do not leave Barcelona without having a meal at Cerveceria Catalana. Finally got the best cover photo for my blog lay-out & Lookbook account with this impromptu photo shoot with my talented photographer / friend Benson here in Singapore. We were supposed to just take an OOTD post for Instagram but his Olympus camera was indeed one heck of a stunner. Need to buy an Olympus camera too (very soon)! Happy 50th Birthday Singapore and enjoy the long weekend. After 3 months of no travel, finally I made it again to one of my dream destination that's so near in Singapore but took me years before It really cane into reality! Welcome to Bali, as usual my travel experience in this Island was definitely awesome. I've been busy these past few days at work so for now, will share with you some picturesque postcards with love from Bali. Happy Midweek everyone! 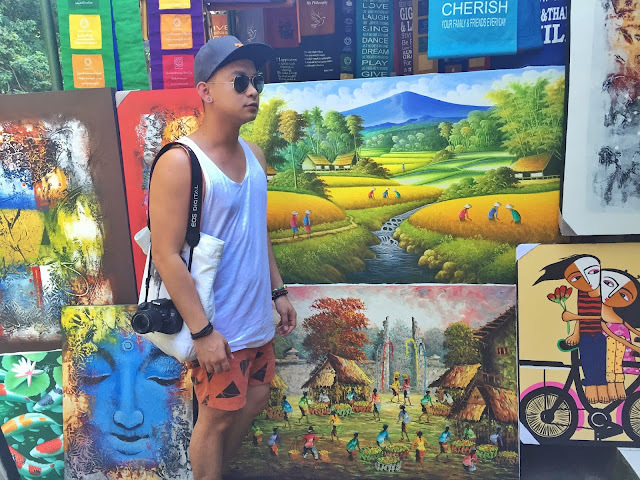 Strolling around Ubud Art Market.